Big power in a compact drill, the Milwaukee 1663-20 is easy to use with its extra long handles. This drill is made for two handed operation which is nice for large hole drilling or material mixing; this drill has the power to handle it. 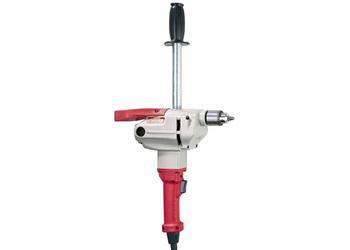 This variable speed drill offers 115 to 450 rpm, perfect for dialing in correct speeds in various materials. It also features electronics that enable the tool to maintain speed settings even under changing loads. A QUIK-LOK® cord is standard. Hi-torque and versatility makes this our premium offering. Dial speed control 115-450 rpm.